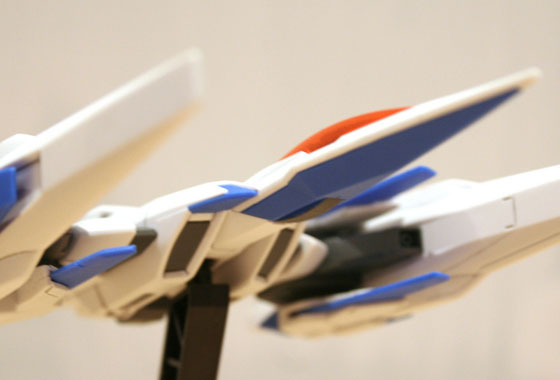 Part two of this three-parter covers 00’s support unit, the super sleek 0 Raiser! 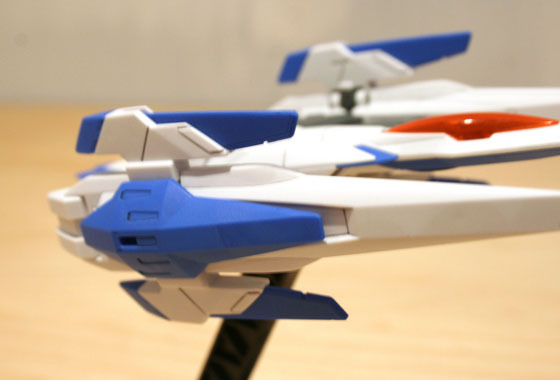 The 0 Raiser’s main task is to dock with the 00 to stabilise it’s twin-drive system, but alone it’s still a capable fighter-type unit. For it’s size, the 0 Raiser is an impressively detailed model, packing lots of panel lines and articulated parts into it’s diminutive form. It also had a real weight quality to it and never feels flimsy. I painted a couple of bits to avoid using foil stickers and the rest of the detailing comes from panel lining, this unit actually has much more scope for detailing than the 00 itself! Being a fighter there really aren’t many points of articulation readily available compared to a bipedal Mobile Suit, but this kit still delivers. 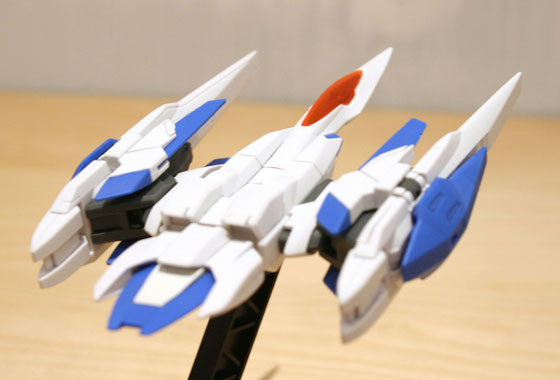 Each wing has a fin on the top and bottom which can pivot upward, the blue parts can also move up and down. 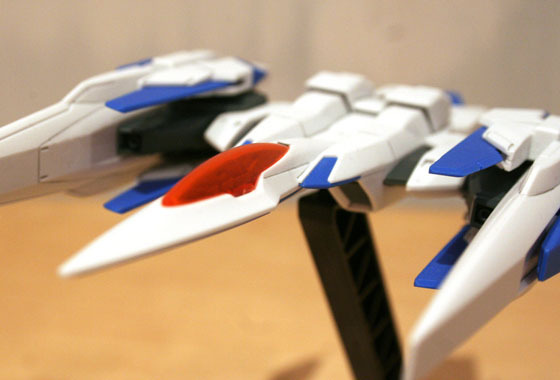 The whole wing unit can also swing out to give a forward swept wing effect! Hmm.. strictly speaking the 0 Raiser itself is one big weapon, but as far as physical weapons included with the kit, it falls pretty short as none are included. 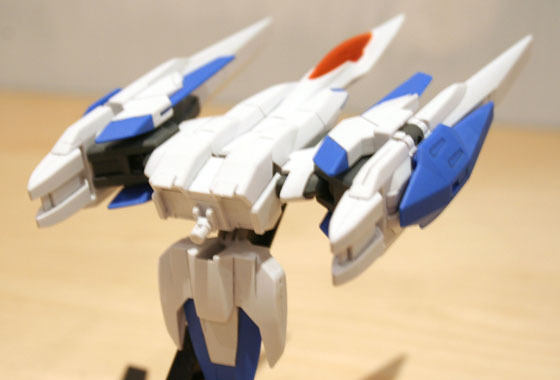 The GN Shields from the 00 can connect to the wings though which looks pretty funky. Very pleasantly surprised by this kit, I assumed seeing as it’s a support unit and quite small it’d be of a fairly low quality and detail but it delivers on both big style! 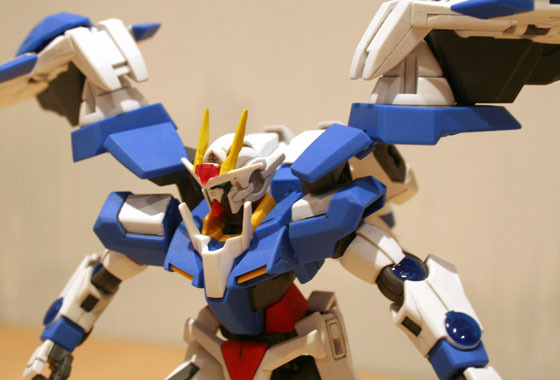 In the third and final part of this review i’ll be checking out the 00 Raiser! Looking at how the 00 and Raiser combine and all the extra weapons available! quite like that little ship! i’d almost build it on its own if it was’nt so expensive. good reviews by the way, get building big red! 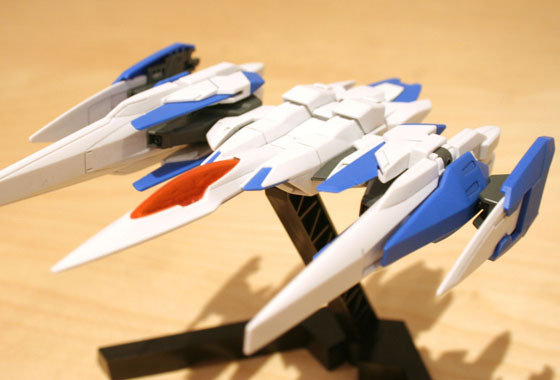 Getting the 00 Raiser makes it a bit cheaper and you get all the extra weapons bundled in too! It’s almost like you read my mind, just posted my first Red Frame worklog!